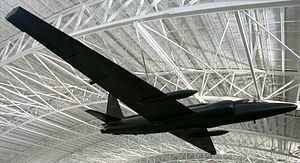 On 1 May 1960, a United States U-2 spy plane was shot down by the Soviet Air Defence Forces while performing photographic aerial reconnaissance deep into Soviet territory. 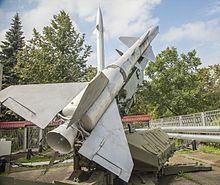 The single-seat aircraft, flown by pilot Francis Gary Powers, was hit by an S-75 Dvina (SA-2 Guideline) surface-to-air missile and crashed near Sverdlovsk (today's Yekaterinburg). Powers parachuted safely and was captured. 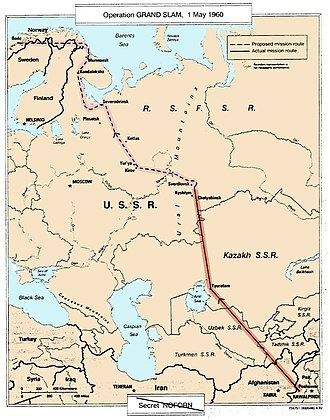 Initially, the US authorities acknowledged the incident as the loss of a civilian weather research aircraft operated by NASA, but were forced to admit the mission's true purpose when a few days later the Soviet government produced the captured pilot and parts of the U-2's surveillance equipment, including photographs of Soviet military bases taken during the mission. Khrushchev visits display of U-2 wreckage. Four days after Powers' disappearance, NASA issued a very detailed press release noting that an aircraft had "gone missing" north of Turkey. The press release speculated that the pilot might have fallen unconscious while the autopilot was still engaged, even falsely claiming that "the pilot reported over the emergency frequency that he was experiencing oxygen difficulties." To bolster this, a U-2 plane was quickly painted in NASA colors and shown to the media. Under the impression that the pilot had died and that the plane had been destroyed, the Americans had decided to use the NASA cover-up plan. Nikita Khrushchev used the American misstep to embarrass President Eisenhower and his administration. I must tell you a secret. When I made my first report I deliberately did not say that the pilot was alive and well ... and now just look how many silly things the Americans have said. Already from 1948, Norwegian Selmer Nilsen had been recruited by the Soviet intelligence organization GRU, amongst other foreigners, to spy on allied activity in NATO countries. Nilsen was assigned to watch allied military activity in northern Norway. The U-2 operations were linked with the airport Bodø, which was one of its permanent stations. Selmer Nilsen recorded U-2 activity in Bodø and forwarded much military information to the Soviet Union. He was convicted for espionage in 1968 in a closed trial in Norway, with a penalty of seven years and six months' imprisonment. He was released after three years. The Summit was attended by Eisenhower, Khrushchev, French President Charles de Gaulle, and British Prime Minister Harold Macmillan. It was the first conference to be attended by both Soviet and western leaders in five years. However, prospects for constructive dialogue were dashed by the explosive controversy surrounding the U-2 flight over Soviet territory. 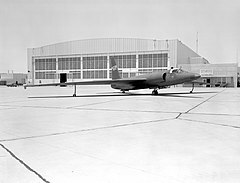 Wikimedia Commons has media related to 1960 U-2 incident. ^ Walsh, Kenneth T. (6 June 2008). "Presidential Lies and Deceptions". US News and World Report. Archived from the original on 29 September 2008. ^ a b c Orlov, Alexander. 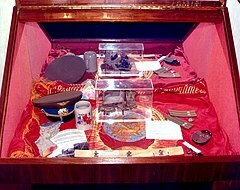 "The U-2 Program: A Russian Officer Remembers". Archived from the original on 13 July 2006. Retrieved 8 January 2007. ^ Amjad Ali, the Pakistani ambassador to the US at the time, narrated in his book Glimpses (Lahore: Jang Publishers, 1992) that the personal assistant of Suhrawardy advised embassy staff of the Prime Minister's agreement to the US facility on Pakistan soil. ^ Brugioni, Dino A., and Doris G. Taylor. Eyes in the Sky: Eisenhower, the CIA, and Cold War Aerial Espionage (Annapolis, MD: Naval Institute, 2010), pp. 343–46. ^ a b c d e Pocock, Chris (2000). The U-2 Spyplane: Toward the Unknown – A New History of the Early Years. Atglen, PA: Schiffer Military History. ISBN 978-0-7643-1113-0. ^ Harford, James (1997). Korolev: How One Man Masterminded the Soviet Drive to Beat America to the Moon. John Wiley & Sons. ISBN 0-471-14853-9. ^ Oleg A. Bukharin. "The Cold War Atomic Intelligence Game, 1945–70". Studies in Intelligence. Central Intelligence Agency. 48. ^ a b Powers, Francis Gary; Gentry, Curt (1970). Operation Overflight: A Memoir of the U-2 Incident. London: Hodder & Stoughton. ISBN 978-0-340-14823-5. ^ a b c d Банцер, Сергей (Sergey Bantser). "Как сбили Пауэрса" [How Powers was shot down] (in Russian). Retrieved 4 April 2016. ^ Surface-to-Air Missile Site Near Sverdlovsk USSR, Central Intelligence Agency Photographic Intelligence Brief B-1009-59, 13 August 1959. ^ Burrows, William E. (1986). Deep Black: Space Espionage and National Security. New York: Random House. ISBN 0-394-54124-3. ^ a b Khrushchev, Sergei (September 2000) "The Day We Shot Down the U-2: Nikita Khrushchev's son remembers a great turning point of the Cold War, as seen from behind the Iron Curtain". American Heritage magazine. Volume 51, Issue 5. ^ Brugioni and Taylor (2010), p. 346. ^ Congressional Record, 5-5-60, pp. 9493–94; quoted in Barrett (2005), p. 384. ^ David M. Barrett, CIA and Congress: The Untold Story from Truman to Kennedy (Lawrence: University Press of Kansas, 2005), p. 384. ^ a b Brugioni and Taylor (2010), pp. 346–47. ^ Beschloss (1986), pp. 234, 242-52; quoted in Barrett (2005), p. 386. ^ Thompson to State Department, 5-9-60, FRUS: Eastern Europe, 1955–1957, Soviet Union, vol 10, pp. 519–21; quoted in Barrett (2005), p. 387. ^ Whitman Diary, Whitman File, DDE diary, 5-9-60. Box 5, DDE Library; quoted in Barrett (2005), p. 387. ^ Congressional Record, 5-9-60, pp. 9979–87, A3941. "Briefing of Congressional Leadership ... 9 May 1960," Dulles FOIA Papers; quoted in Barrett (2005), p. 388–89. ^ Congressional Record, 5-10-60, pp. 9854–55; quoted in Barrett (2005), p. 395–97. ^ Barrett (2005), p. 397. ^ Public Papers of the Presidents, 1960, pp. 403–09, 414-15; quoted in Barrett (2005), pp. 398–400. ^ Covert Action: An Effective Instrument of U.S. Foreign Policy? (txt) (Report). Congressional Research Service (published February 2, 2009). October 21, 1996. Retrieved December 10, 2018. ^ "U-2 Incident Exhibit". National Cryptologic Museum. National Security Agency - Central Security Service. Archived from the original on 22 June 2008. Retrieved 10 February 2007. ^ a b "1960: East-West summit in tatters after spy plane row". BBC News. 17 May 1960. Retrieved 22 May 2013. ^ a b c "Loss of Spy Plane Sabotaged 1960 Summit". Retrieved 22 May 2013. ^ Russia, 1960/05/05 (newsreel). Universal-International News. 5 May 1960. Retrieved 22 May 2013. ^ Beschloss, Michael (1986). Mayday: Eisenhower, Khrushchev, and the U-2 Affair. New York: Harper & Row. p. 274. ISBN 978-0-06-015565-0. ^ Summit Crisis. Mr. K. In Ugly Mood Over U-2 Incident, 1960/05/16 (1960) (newsreel). Universal-International News. 16 May 1960. Retrieved 22 May 2013. ^ a b "Modern History Sourcebook: Khrushchev and Eisenhower: Summit Statements, May 16, 1960". Retrieved 22 May 2013. ^ Geelhoed, Bruce E.; Anthony O. Edmonds (2003). Eisenhower, Macmillan, and Allied Unity, 1957–1961. New York: Palgrave Macmillan. p. 101. ISBN 978-0-333-64227-6. ^ a b Tucker (2008), p. 1320. ^ United Nations Security Council Verbatim Report 857. S/PV/857 23 May 1960. Retrieved 29 August 2008. ^ United Nations Security Council Verbatim Report 858. S/PV/858 24 May 1960. Retrieved 29 August 2008. ^ United Nations Security Council Verbatim Report 859. S/PV/859 25 May 1960. Retrieved 29 August 2008. ^ United Nations Security Council Verbatim Report 860. S/PV/860 26 May 1960. Retrieved 29 August 2008. ^ United Nations Security Council Verbatim Report 860. S/PV/860 page 17. 26 May 1960. Retrieved 29 August 2008. ^ United Nations Security Council Document 4321. Union of Soviet Socialist Republics: draft resolution S/4321 23 May 1960. Retrieved 29 August 2008. ^ Hamid Hussain. "Tale of a love affair that never was: United States-Pakistan Defence Relations". Archived 4 March 2012 at the Wayback Machine The Defence Journal, June 2002. ^ "Pentagon's new demands". The News International. 14 March 2008. Archived from the original on 16 October 2008. ^ Bogle, Lori Lynn, ed. (2001), The Cold War, Routledge, p. 104. 978-0815337218. ^ "Three days in 300 years: Spies on the bridge". Retrieved 2 June 2010. ^ Lax, Mark. From Controversy to Cutting Edge: A History of the F-111 in Australian Service. Canberra, Australia: Air Power Development Centre, Department of Defence (Australia). p. 15. ISBN 978-1-920800-54-3. ^ Penkovsky, Oleg (1966). The Penkovsky Papers: The Russian Who Spied for the West. London: Collins. OCLC 2714427. ^ "CIA documents show US never believed Gary Powers was shot down". The Times. Times Newspapers Limited. (Registration required (help)). ^ Schwartz, Stephen I. (1998). Atomic Audit: The Costs and Consequences of U.S. Nuclear Weapons Since 1940. Brookings Institution Press. p. 679. ISBN 0-8157-7774-4. ^ a b Schwartz, Stephen I. (22 December 1997). "Letter to the editor: Stephen I. Schwartz, Director U.S. Nuclear Weapons Cost Study Project, Brookings Institution, Washington". Time. Archived from the original on 17 October 2009. Retrieved 20 June 2012. ^ Karafantis, Layne (27 October 2015). "Bridge of Spies: An Opportunity to Bust Myths about the U-2 and the Capture of Gary Powers". AirSpaceBlog: Behind The Scenes at the National Air and Space Museum. The National Air and Space Museum. ^ Jason Caffrey (3 January 2016). "Gary Powers: The U-2 spy pilot the US did not love". BBC magazine. Retrieved 4 January 2016. Sergei N. Khrushchev. Nikita Khrushchev and the Creation of a Superpower. State College, PA: Penn State Press, 2000. ISBN 978-0-271-01927-7. Jay Miller. Lockheed U-2; Aerograph 3. Aerofax Inc., 1983 (paperback) ISBN 0-942548-04-3. Chris Pocock. Dragon Lady; The History of the U-2 Spyplane. Osceola, WI: Motorbooks International, 1989 (paperback). ISBN 978-0-87938-393-0. Chris Pocock. 50 Years of the U-2; The Complete Illustrated History of the "Dragon Lady". Atglen, PA: Schiffer Military History, 2005. ISBN 978-0-7643-2346-1. Phil Taubman. Secret Empire: Eisenhower, the CIA, and the Hidden Story of America's Space Espionage. New York: Simon & Schuster, 2003. ISBN 0-684-85699-9. David M. Watry. Diplomacy at the Brink: Eisenhower, Churchill, and Eden in the Cold War. Baton Rouge: Louisiana State University Press, 2014. Nigel West, Seven Spies Who Changed the World. London: Secker & Warburg, 1991 (hard cover). ISBN 978-0-436-56603-5. London: Mandarin, 1992 (paperback). ISBN 978-0-7493-0620-5. Farewell address / " Military–industrial complex"
" And I don't care what it is"